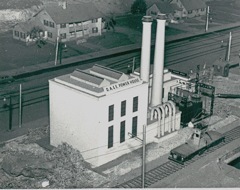 1948 Halleck street photos: The OA&E Power house was built by Elmer Cummings, and for many years it was on the north end of the Halleck street trolley line. 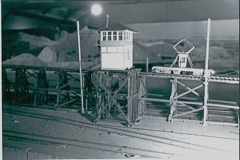 It is now on the south section of your O gauge line. 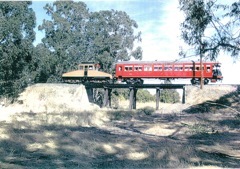 California Railway 10 was also built by Elmer in early 1940s or before. I added the link for the link and pin couplers and repainted it. Trim and lettering is still missing. 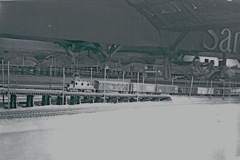 Key System 701 and 3 thirty six foot flat cars were originally built by Elmer. I helped Elmer motorize the 701 an made an air compressor for it. Recently I modified one of the flat cars to accept link and pin couplers. 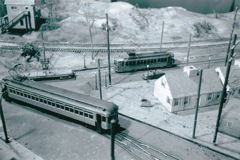 Elmer also made the 271 and a 900 series Key System street car. I added proper fenders to 271. It requires painting, and much work is needed to finish the 900. The Long 500 was originally built by Bill Hoffman and owned by Jack Collier. It runs fine. 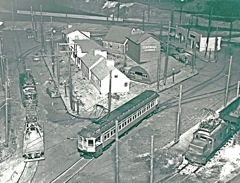 Prior to WW 2 there were 2 motor flat cars under construction for operation on the Halleck St. trolly layout line. One was Elmer Cummings Key System 1208. 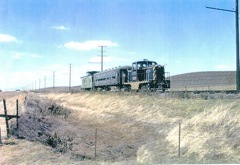 The other prototype was Northern Electric 701 that ran between Chico and Halminton City. 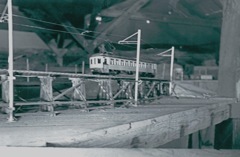 The smallest motors available for use in an O gauge model was the Pittman DC 60. The problem was fitting these motors in the model. 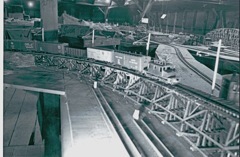 Elmer Cummings came up with the idea of driving only one axle and modifying the other axle to clear the magnet in each truck. The motors for the 701 ended up in the 1208. Elmer's 1208 runs well with his two flat cars in tow. 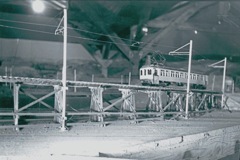 The fate of Northern Electric 701 is unknown. I built SN 660 with help from Elmer Cummings. 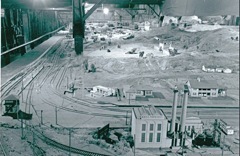 During WW 2 there was a derailment in Shepherd Canyon. 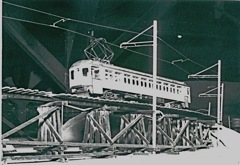 Sacramento Northern's two 1500 Volt Baldwin Westinghouse locomotives were descending from the tunnel headed for the Oakland Army base. A box car loaded with #10 cans of pears derailed. 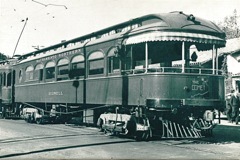 The first locomotive went on to 40th and Shafter. 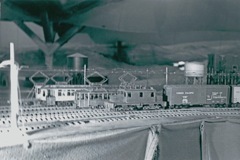 George Hademan stayed in the rear locomotive, and spent the night guarding the the the rear half of the train. My mother made Georges dinner. This narration compiled and edited from email converstations with Tomas Buckingham, Nov. 2008 -Jeff Rowe. All photos by Tomas Buckingham. Additional photos from the Ken Shattock collection.